About 2 weeks ago I attended a launch event of Dyson Supersonic partnered with POPBELA at Pondok Indah Mall. The event was not big. Only few bloggers came that day. POPBELA and Beauty Fest Asia team gave some of us tickets for Beauty Fest Asia 2017. There was Catherine Sumitri who did talkshow but unfortunately I couldn't see it because of an errand that day. Dyson Supersonic is probably the most expensive hair dryer in Asia. But it's definitely worth every penny. And why is that? Dyson Supersonic hair dryer helps prevent extreme heat damage to protect natural shine. Air temperature is measured 20 times every second, keeping the temperature under control. Drying shouldn't take forever. For fast drying you need controlled, high velocity airflow. The weight and the shape is unique because it's engineered for balance. And the best thing, Dyson Supersonic hair dryer can dry and style your hair at the same time! With the Dyson Styling concentrator, you can shape your hair one section at a time – without worrying about disturbing the rest. I actually tried the hair dryer (with help) to style my dull and frizzy hair. It turned out perfect! My hair is straighter and of course, less frizzy and soft. I love how my hair turned out! Anyway, have you read my post about SOCIOLLA 2ND ANNIVERSARY? If not, go check it and don't miss all the discounts and giveaway event! 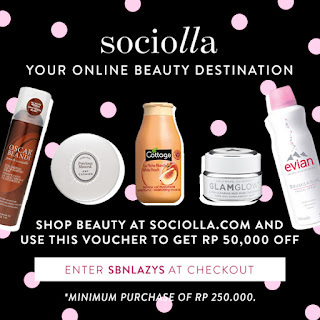 You can get Rp 50.000,- discount for minimum purchase of Rp 250.000,- with voucher code SBNLAZYS or simply click the picture below. If you're curious about the anniversary promo, simply clik HERE. Must go now. See ya!